Waverley is an 1814 historical novel by Sir Walter Scott. 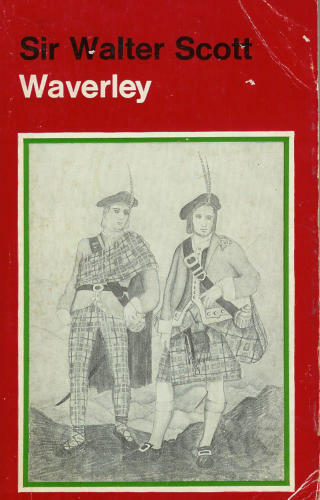 Initially published anonymously in 1814 as Scott's first venture into prose fiction, Waverley is often regarded as the first historical novel. The novel became so popular that Scott's later novels were advertised as being "by the author of Waverley". Set during the Jacobite rising in Scotland in 1745, this novel springs from Scott's childhood recollections and his desire to preserve in writing the features of life in the Highlands and Lowlands of Scotland. Chivalric novel, skillful blend of historic reality, high adventure and chivalric romance in Medieval England. Ivanhoe returns from the Crusades and defendedst Rebecca against a charge of witchcraft, but Lady Rowena is his true love. Amy is married to the Earl of Leicester, one of the queen's favorites, who must keep his marriage secret or else incur royal displeasure. Rich in character, melodrama, and romance, Kenilworth is rivaled only by the great Elizabethan dramas. This novel helped establish the historical novel as a literary form. In rich prose and vivid description, author follows the adventures of Frank Osbaldistone, who is sent to Scotland and finds himself drawn to the powerful figure of Rob Roy. Scott wrote this novel in 1827, the first of his last six hard years as he struggled to solve the financial problems that had come to consume his life. The book is filled with drama and humor, while set in one of the most interesting times.